Library image #2640: Overlooks of the Colorado River as it runs through Black Canyon. It is still a river at this point even though it is part of Lake Mohave due to its current. 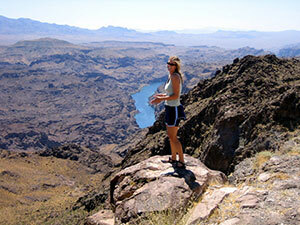 The United States Congress designated the Black Canyon Wilderness (map) in 2002 and it now has a total of 17,220 acres. All of this wilderness is located in Nevada and is managed by the National Park Service. Home to the picturesque and rugged Eldorado Mountains, the Black Canyon Wilderness is a maze of peaks and side canyons with vertical cliffs extending to the edge of the Colorado River. Much of the terrain was formed by volcanism. This scenic area contains some remnants of past mining. Water is scarce and the summer temperatures can reach 120 degrees. Archeological resources include petroglyphs, lithic scatters and an intaglio. Mountain lions, bighorn sheep, coyotes, and jackrabbits are among the many creatures that inhabit the area. Watch closely for the side-blotched lizard, rattlesnake, or desert tortoise caught sunning itself in the afternoon sun.